The Paeligni were a group of Italics who, during the Iron Age, were located in the Valle Peligna in the eastern centre of the country, now in the region of Abruzzo. They were neighboured to the north by the Sabini and Vestini, to the east by the Marrucini and Frentani, to the south by the Samnites, and to the west by the Marsi. The Oscan-Umbrian group of which the Paeligni were part are largely accepted as being Indo-Europeans (perhaps proto-Celts) who migrated into the peninsula from the north. They settled in communities in the Valle Peligna (which is also known as the Conca di Sulmona), a plateau in modern Abruzzo. The name of the valley appears to originate from the Greek 'peline' which means 'muddy', referring to the land left after an ancient lake that filled the bottom of the valley was drained away following earthquakes. The River Aternus (the modern Aterno) crosses the valley, placing this people a little way below the Vestini who were settled near its headwaters. The Paeglini were formed by three groups, each of which was based around one of their major settlements, giving them the names Corfinienses (of Corfinium, a major mountain stronghold), Sulmonenses, and Superequani. The nearby Frentani seem to have joined the Samnites as that confederation expanded its territory towards the Adriatic coast, but it seems that their location allowed them to act independently, and for the most part they were seen as a fully independent people. They generally had much more in common with the minor peoples to their north, the Marrucini, Paeligni, and Vestini. Their language came from the Oscan-Umbrian group of Indo-European languages (P-Italic), which were widely spoken in Iron Age central and southern Italy before the rise to dominance of Latin (Latin itself was a slightly more distantly related language, coming from the Indo-European Latino-Faliscan group, or Q-Italic). Their name has been tentatively suggested to mean 'the halfbreeds', suggesting a splinter group that interbred with another, neighbouring group, but even this hypothesis is based on very little evidence. Another idea links the name to the mountainous land they inhabited, with an Illyrian word root that may have survived from the Italic migration into the peninsula. The Marsi ally themselves with the Romans as a means of removing Samnite mastery over them, while the Dauni, Iapyges, Lucani, Messapii, and Peucetii side with the Samnites at the start of the Second Samnite War. It is in this period that the Paeligni are first documented historically, when they are recorded as being confederates of the Marrucini, Marsi, and Vestini tribes. This late appearance suggests that the Paeligni are a splinter from a larger group, a frequent process in Iron Age Italy, but which group is unknown. Unusually, few of the ancient writers give them a background, although Ovid calls them descendants of the Sabini. Inscriptions left by the Paeligni show marked similarities with those of the Samnites and Lucani, suggesting a shared heritage, but also showing enough differences to warrant regarding the Paeligni as an independent group that has been in existence for a good couple of centuries or more. 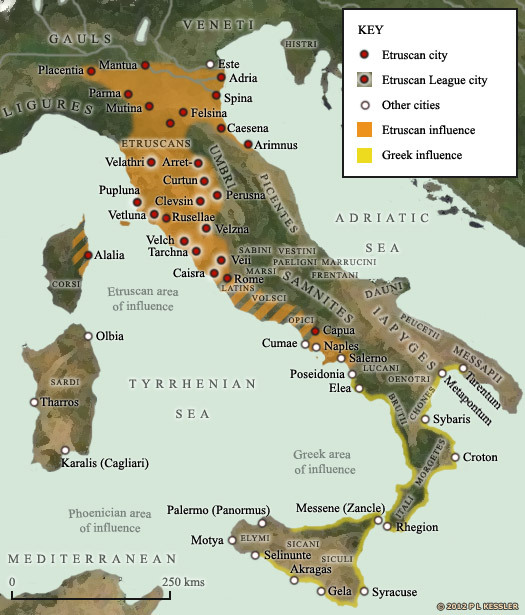 Following the Roman destruction of the Aequi and the final defeat of the Samnites at the end of the Second Samnite War, the Frentani, Marrucini, Marsi, and Paeligni voluntarily accept their reintegration into Roman administrative rule. The Second Punic War starts at Saguntum (near modern Valencia) in Hispania. Hannibal Barca attacks Roman territory, leading his armies over the Alps into Italy. While encouraging the reluctant Romans to commit to battle, he marches through the country devastating the lands of Rome's Italic allies, including that of the Marrucini, Marsi, and Paeligni. Despite winning the anticipated battle at Cannae, Hannibal is eventually defeated by Scipio Africanus at the Battle of Zama in 202 BC, ending the war. Along with the Etruscans, Lucani, Marrucini, Marsi, Picentes, Samnites, and Vestini, the Paeligni fight the Social War (Italian War, or Marsic War) against Rome. The war is the result of increasing inequality in Roman land ownership, and the spark for conflict is delivered by the assassination of the reforming Marcus Livius Drusus, whose efforts would have led to citizenship for all of Rome's allies. The role of the Paeligni in the war is not clear, although they choose their mountain fortress of Corfinium as their headquarters during the war, renaming it Vitellio (probably an Osco-Umbrian form of 'Italy'). They do not have their own senior commander so their forces are probably combined with those of the Marrucini or Vestini, but they do strike their own coins. Although defeated, the Italic tribes are granted the Roman citizenship which had previously been withheld from them, and are gradually absorbed into the Roman Latin culture and language.